Many schools and educators are adopting a ‘constructivist’ approach to teaching. This is closely tied in to the embedding of ICT in the learning framework at primary and post primary level. 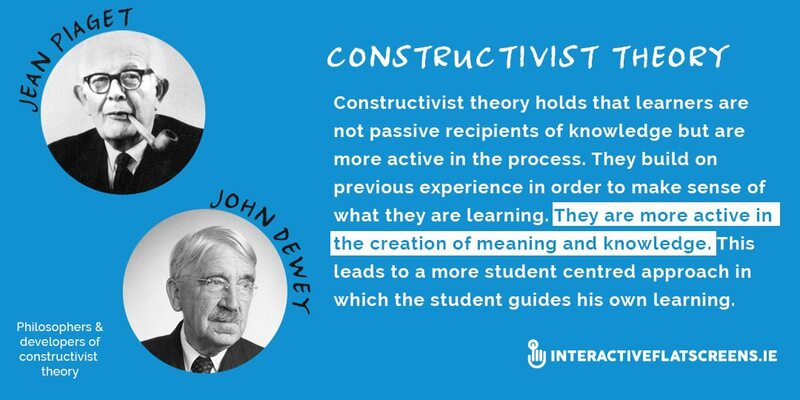 For those of you who don’t know, constructivist teaching methods are based on constructivist learning theory which was conceived and developed by two major thinkers: Jean Piaget and John Dewey. These philosophers were very influential in the development of progressive, informal education. Constructivist theory holds that learners are not passive recipients of knowledge but are more active in the process. They build on previous experience in order to make sense of what they are learning. They are more active in the creation of meaning and knowledge. This leads to a more student centred approach in which the student guides his own learning. So how does ICT fit into all of this? Well, the introduction of iPads and tablets into the classroom gives pupils greater power and autonomy over what they are learning. These devices give instant access to knowledge so the pupil becomes his own teacher, to a certain extent. Learning through play is also part of the progressive, constructivist approach. Picture a child playing with building blocks, absorbed in the activity and on his own. This is the best possible visualisation of constructivist learning theory. 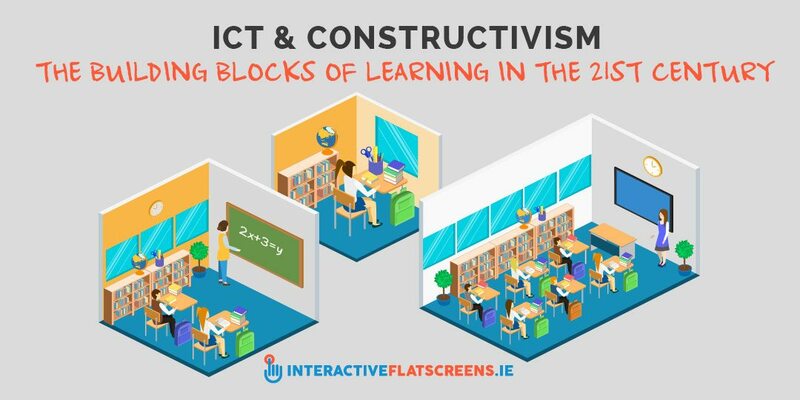 ICT, in the form of iPads, tablets, mobile devices and interactive flat screens, allow for greater engagement and interaction by the learner which means more fun and play. The approach also helps with class discipline because it allows for a more interesting learner experience. Less boredom means less discipline problems. It also helps with self-esteem and the learner’s faith in the education system. There is, in the idea of play, the notion that children are preparing themselves for taking on a role in the adult world. ‘The child is father to the man,’ as the poet William Wordsworth said. By embracing ICT, schools are better preparing their pupils for further education, higher education and on to the workplace. Learning about computers e.g. computer coding, as well as learning through computers should begin at primary level and continue into the junior and senior cycles. Constructivist learning theory is an optimistic, enlightened approach to education in which the child is seen as capable of learning on his own. Empowering pupils with tablets, and teachers with interactive touch screen monitors allows for a blended approach to teaching which is now becoming the norm. Yes, the old totalitarian method of teaching is being replaced by something more fun and effective. The revolution is well and truly under way and it is being driven by ICT. 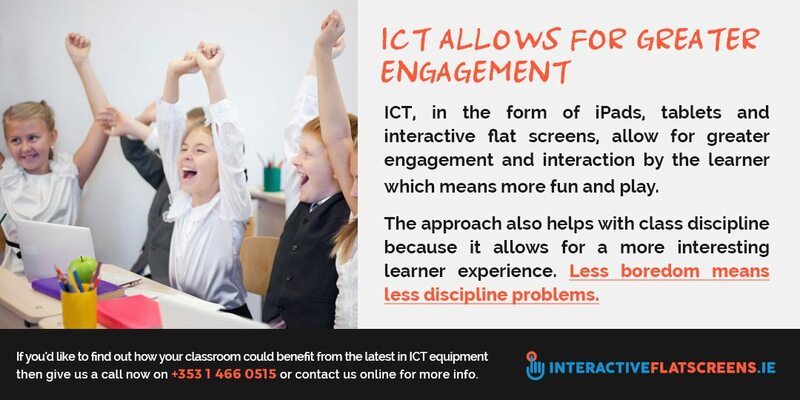 If you’d like to find out how your classroom could benefit from the latest in ICT equipment then give us a call now on +353 1 466 0515 or contact us online for more info.